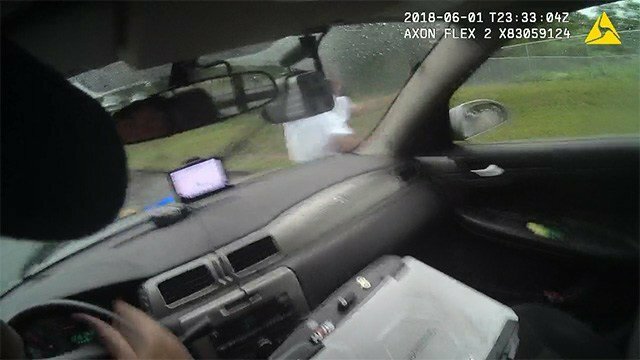 Officer Saulters was originally placed on administrative leave pending an internal affairs investigation, but after reviewing body-camera footage, Police Chief Scott Freeman terminated his employment with the department. As another officer arrives on the scene, Saulter explains that the growing crowd is upset because "I got him with my auto". The footage shows the exact moment that Saulters rammed into Timmy Patmon, who was wanted on a felony probation warrant, during a pursuit. When he exits the vehicle, he immediately tells other police officers, "I didn't hit him with the auto; I blocked him with the auto". See the video below, which appears to show the officer using his auto as a weapon. Patmon was taken to the hospital for his injuries before being turned over to the jail. "He hit the ground, but I mean... he was running this way... and he ran into the hood of my vehicle and bounced off". "Why'd you hit that man with your auto like that?" an approaching woman shouts. As Saulters and his partner, officer Hunter Blackmon, put Patmon in handcuffs, a woman screams "You just hit that man, oh my god". "Give us your hands now, or you're gonna get Tased", Saulters tells Patmon. "Do you understand me?" Later in the 13-minute clip, Saulters told other officers that he "didn't hit [Patmon] with the vehicle, I blocked him with the auto". Saulters then accelerated again and turns right, hitting Patmon with the right front quarter panel of his vehicle. He suffered bruises and scrapes and faces charges of obstructing a law enforcement officer and violating probation. "I appreciate that, because that make them look bad, and I know good and well they trainers don't train no one to run over people's children", Brown said. Saulters was immediately placed on administrative leave, but was sacked the next day following an independent investigation. The Georgia State Patrol and Georgia Bureau of Investigation have also been asked to conduct independent investigations of the incident.